Here's my version of Morning Joe, I could not be happier with how it all came together. This is a very fun top to sew, I hope you'll add it to your To Do List. The pattern Morning Joe, by Carrie Nelson for Miss Rosie's Quilt Co, has an alternate pattern included with the regular cover pattern, that's what I made, Alternate Joe. But I'm naming my quilt, "I take my coffee black". This is Lifetime Quilt Number 118. 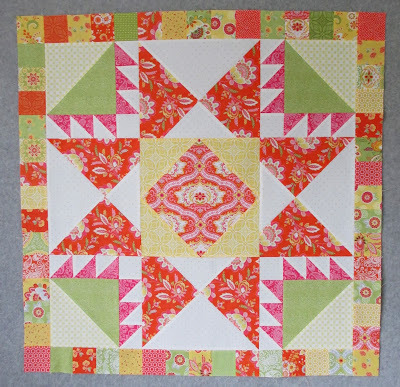 The pattern is Morning Joe by Miss Rosie's Quilt Co. It finished at 52" x 52". 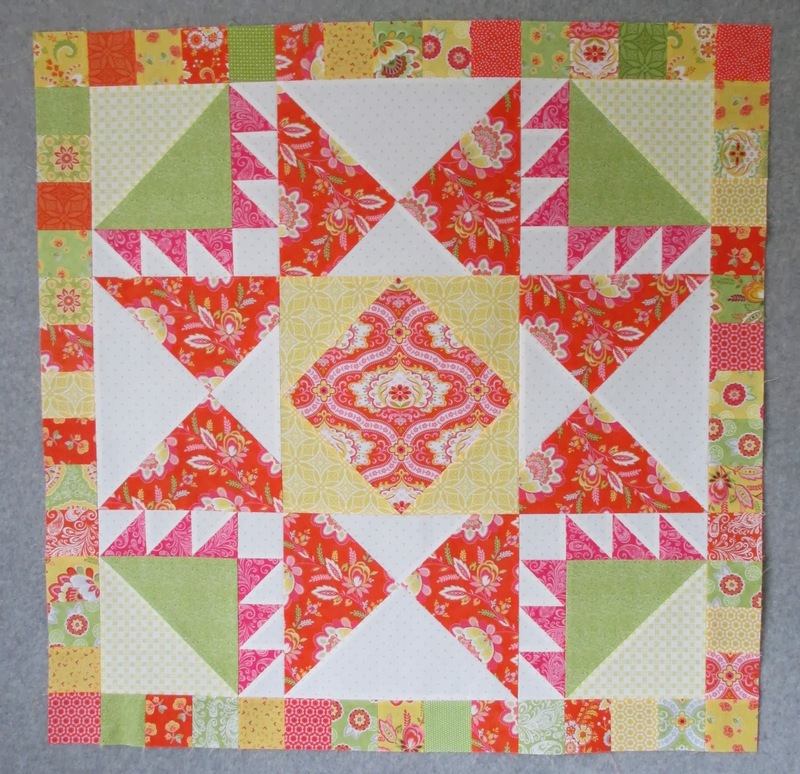 The print fabric is Potluck by Jane Klop for American Jane by Moda. The background fabric is the black Weave by Moda. It has approximately 624 pieces. Yesterday was Cooper's 5th birthday, and since it's Halloween I thought I would share my favorite Cooper picture, Garfield Cooper in his Halloween costume, and loving it, as that happy dog loves most things. I love Cooper more than any dog we've ever owned for one simple reason, he loves us back, what more could I ask for? Have a safe and happy Halloween at your house, and don't forget, Friday is the big Clover Schnibbles Parade over at Sinta and Sherri's blogs. All the little star blocks are pieced. I just threw them on my design as I made them, in no particular order. Next up, finding the perfect place for each one of these stars in this top. I whipped through those smaller half square triangle units in no time. 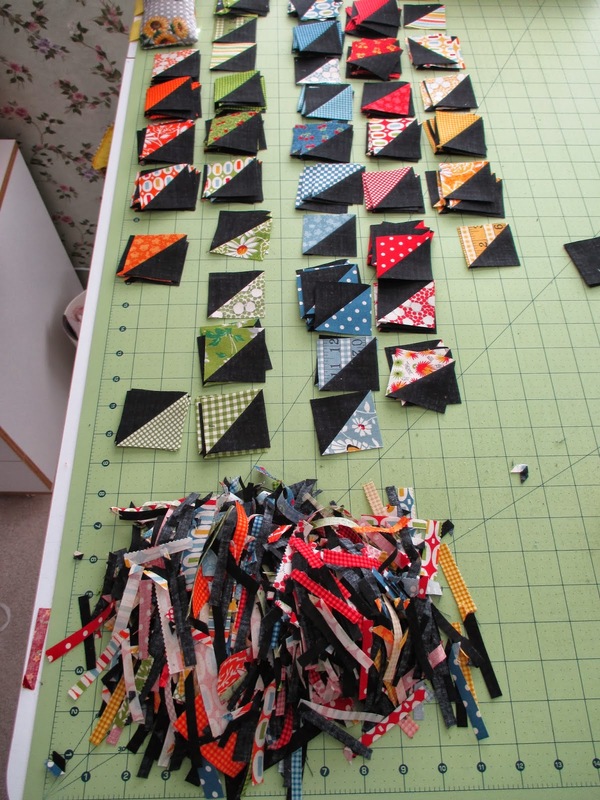 You know my favorite method for perfect hsts, make 'em big and square'em up! Here is one big star block with 4 smaller star blocks. I think the only other colored background I have ever used was red, but I agree with you, that black is a great match for that American Jane fabric, it does seem to just light up against that background. We are not enjoying fall weather where I live, winter has arrived and our trees still have green leaves. I wonder if they'll turn this year or just fall off, time will tell. I hope you're having a beautiful and colorful fall where you live, enjoy it for me! From an empty design wall to this! 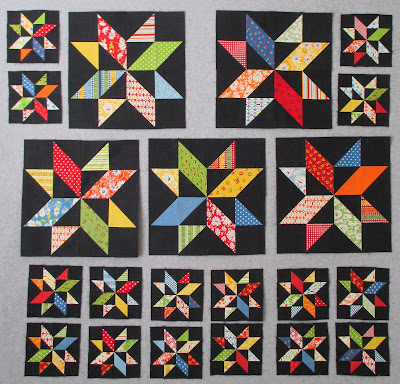 It took no time at all the make the five large star blocks. 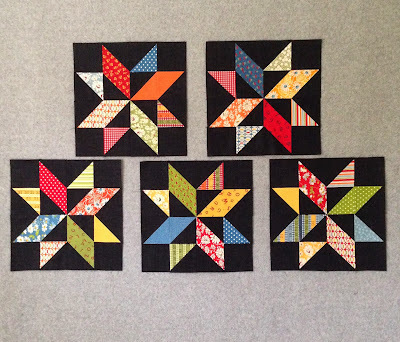 Next up, the four blocks with small stars, which doesn't sound like much but equates to 16 small stars. 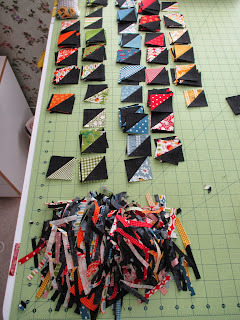 That means more half square triangle units, my favorite block to make by the way. My background fabric is the black print from the new Moda Weave line. I love it, it's not a solid black, but it doesn't really have a design either, the weave pattern is very subtle, it's more shading than lines. It's hard to describe but easy to love. My print fabric is from a few American Jane lines by Sandy Klop for Moda. This is the first time I've used any American Jane fabric, some of her prints are a little too, "down on the farm" for me. But I easily found other prints in the lines that were bright and cheerful that I loved. It's not often that I like every fabric in a line, so this is nothing new for me. The most glaring exception to that rule for me would be High Street by Lily Ashbury for Moda, I loved every print in that bundle. 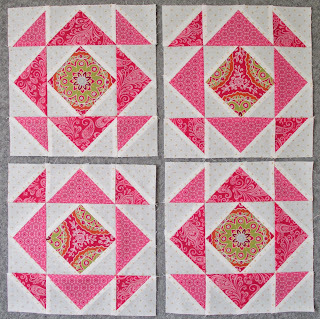 I know you've heard me say this before, but I get so much inspiration from the monthly Schnibbles Sew Along hosted by Sherri/A Quilting Life and Sinta/ Pink Pincushion. And even the months when I don't get around to entering the parade, I still love watching the parade. In the October 1st parade for Mercerie, Michele at Island Life Quilts made an amazing quilt where she combined two different fabric lines from two different designers and went with a dark background. She mentioned that she was trying to get away from using white or cream backgrounds, I thought that was a good challenge for me, so that's why my Morning Joe will be called, "I take my coffee black". Thanks Michele for the inspiration!! 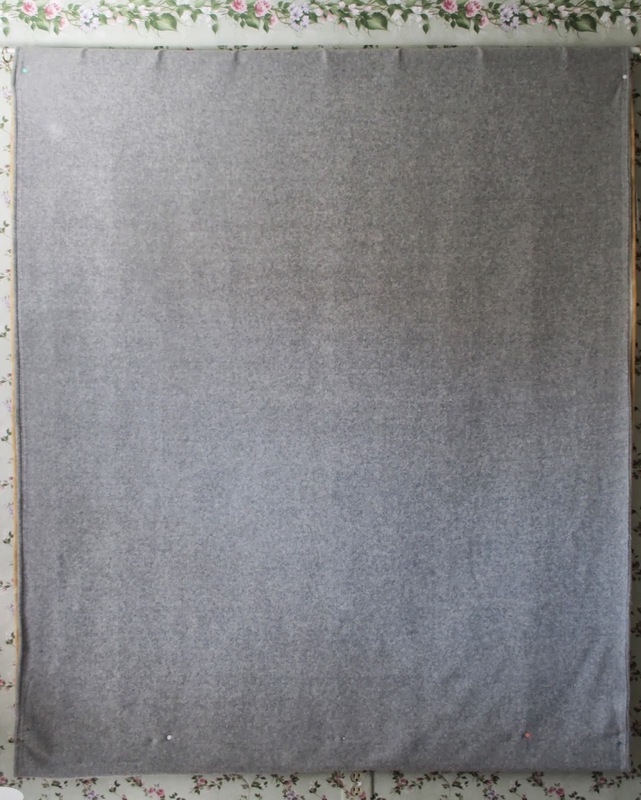 A blank design wall, the possibilities are endless, just like a painter with a blank canvas. I just love starting new projects, especially on a Monday, clean design wall, clean sewing room, nothing to do but get started. I think my canvas is going to look pretty similar to this, Morning Joe, by Miss Rosie's Quilt Co. This pattern has been calling my name since I first saw it. Do you need some Morning Joe too? You can get yours right here! My Summer Wind Quilt is all done, how about a little walk down memory lane. Border 6, the final border! I could not be happier with my end result. This was one fast and easy pattern. 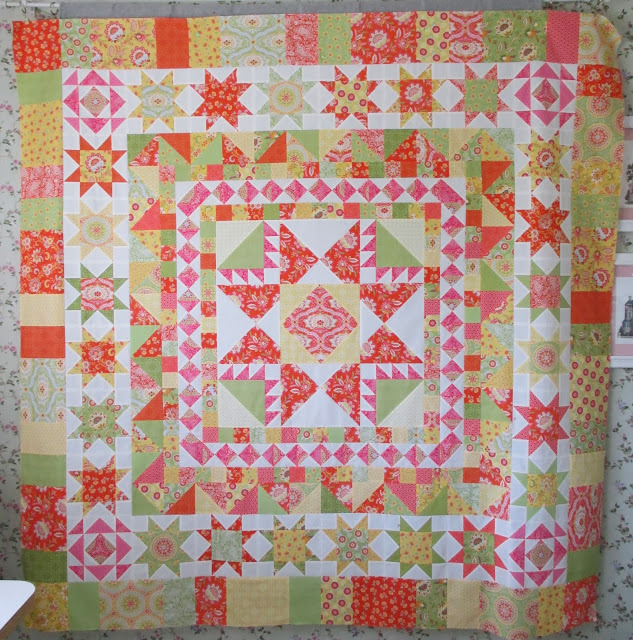 It finished at 76 1/2" x 76 1/2"
The pattern is Summer Wind by Carrie Nelson for Miss Rosie's Quilt Co. The print fabric is High Street by Lily Ashbury for Moda. The white with yellow polkadots background fabric is from Pam Kitty Morning for Lakehouse. It has approximately 1,029 pieces. Sinta at Pink Pincushion finished her Summer Wind too. She's blogging about her finish today. One of the fun things Sinta and I did for our sew along was to text pictures of our daily progress back and forth. It was like we were sewing in the same room, or at least the town, the 1800 miles that actually separated us just disappeared. Sinta, I loved sewing with you, let's do it again!! Sinta and I used the same pattern and same fat quarter bundle of fabric, but you'll be surprised how different the two tops look. I didn't use the gray or berry fabrics in that line because I thought that would make it look too busy. Sinta used all the fabric and her quilt looks less busy, it's fascinating to me. I think someone else could use that same line of fabric and come up with another beautiful top, the look totally depends on which fabric you use where. 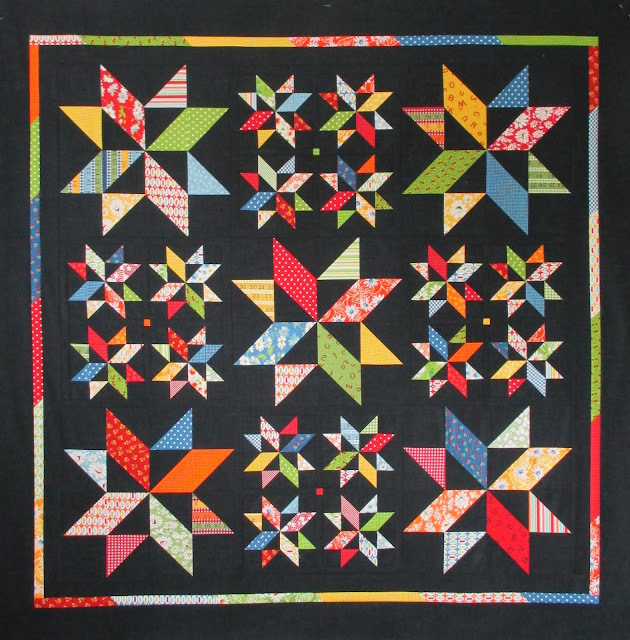 The pattern Summer Wind is in the "A Touch of Rosie Quilts" book released by Leisure Arts in 2010. Carrie plans too add a Summer Wind pdf pattern to her shop very soon, be on the look out for it. I hope you have a great weekend, I plan to! This is the last picture of Summer Wind that I shared with you. At first I didn't notice anything amiss, but one day I walked into my sewing room, looked at this top on my design wall and saw it. and then said, "oh no", or something along those lines that I won't repeat today. I have two like colors touching in border 3 and border 4!! See that weird design made by that orange square up against that orange triangle? For the better part of the day I tried to convince myself that it was OK, that I could live with it. Well it turns out I couldn't, but that's OK, it was an easy fix. And now look, all my border 5 blocks are on. Sinta has her stars ready to go too, only one more border to go for both of us! 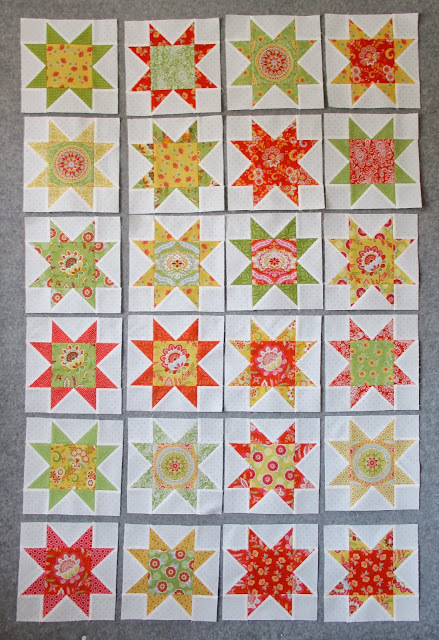 So the next border on my Summer Wind project is 24 stars and 4 alternate corner blocks. I used my Fit to be Geese ruler to make my flying geese units. Sinta at Pink Pincushion is sewing away on her Summer Wind now too. We're using the same pattern and same fat quarter bundle, High Street by Lily Ashbury for Moda, but you would never guess it. Sinta is leaning towards the conservative side and I'm speeding towards the wild side, but I love them both. I can hardly wait to see these blocks on my quilt. 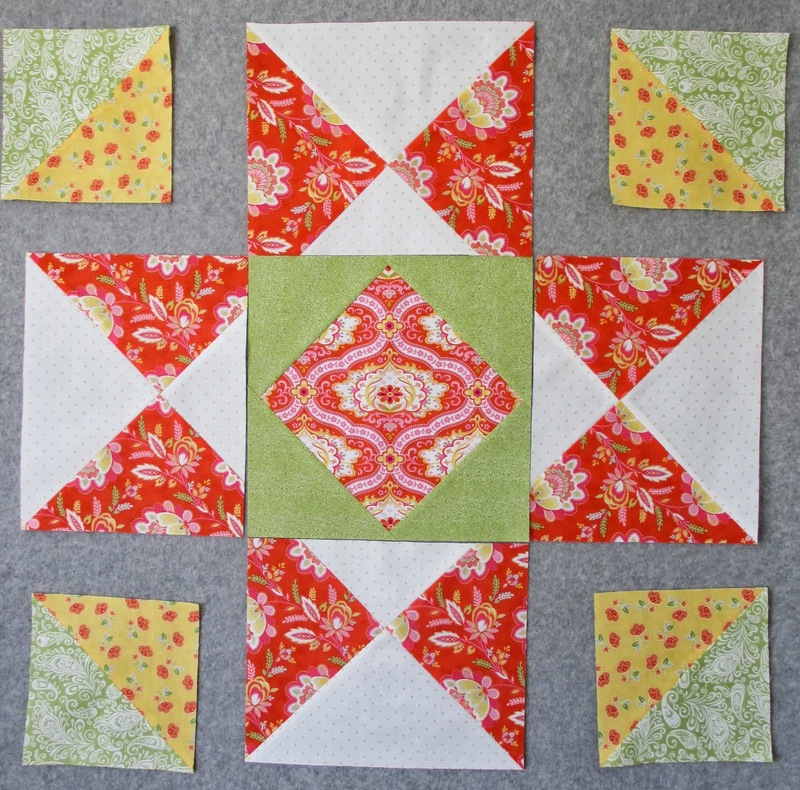 The 3rd border is the same as the first, scrappy squares, easy peasy. The 4th border is half square triangles, and you know how I love half square triangles! 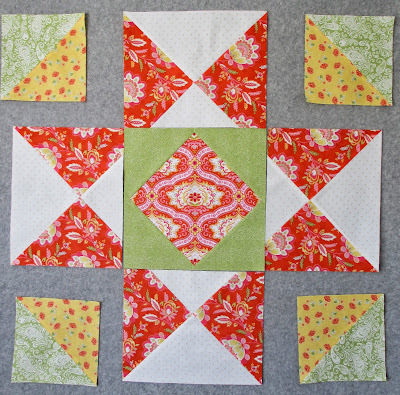 I'm going with three colors in this border, yellow, green and orange. I made sure I pieced an equal number of orange/green, yellow/orange, and yellow/green units. That way I wouldn't accidentally have a dominant color. Again, no problems, everything went together just as it should. Why does it always seem like the projects you love the most go the fastest? Maybe it's because you love them so much that you work on them every chance you get. I'm loving this one. Just a reminder, the fabric is High Street by Lily Ashbury for Moda and the pattern is Summer Wind by Miss Rosie's Quilt Co.
My next project is Summer Wind. 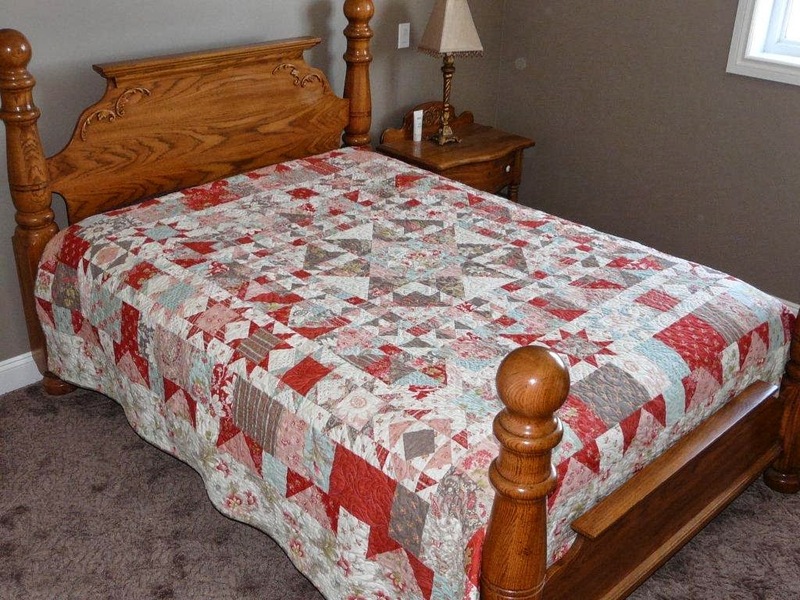 This is an older pattern by Miss Rosie's Quilt Co, you may have this finished quilt on your bed. When I googled this quilt I found a lot of them out in blogland. Do you have friends that share your taste in quilts? Nicole, at Sister's Choice, has excellent taste in quilts, and it's the same as mine. 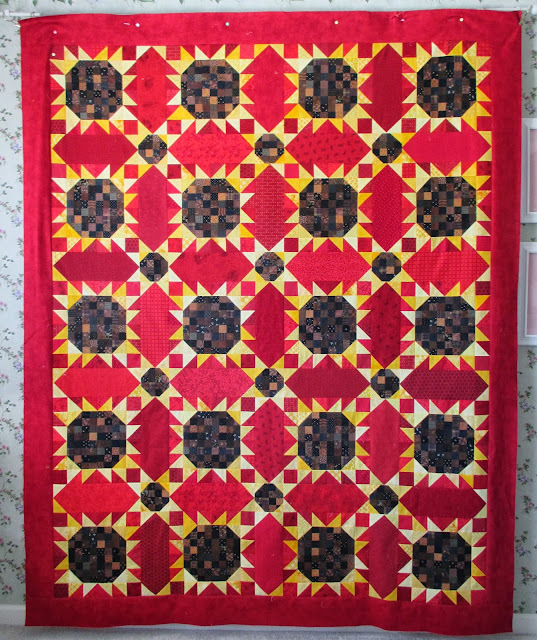 We've sewed several quilts together, Toulouse, Belle Meade, Hallowe'en 1904, Red and White Snowball, Autumn in my Garden, and Hill Country Baskets to name a few. After seeing Nicole's Birdseye and Mocha Trails I made them myself. 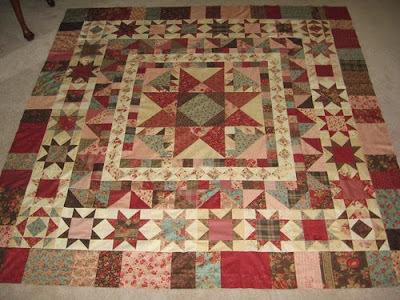 I think a project on Nicole's current To Do list is Wild Air, a quilt I finished last year. And now I'm doing it again, this is Nicole's Summer Wind, made from Astor Manor by Three Sisters. 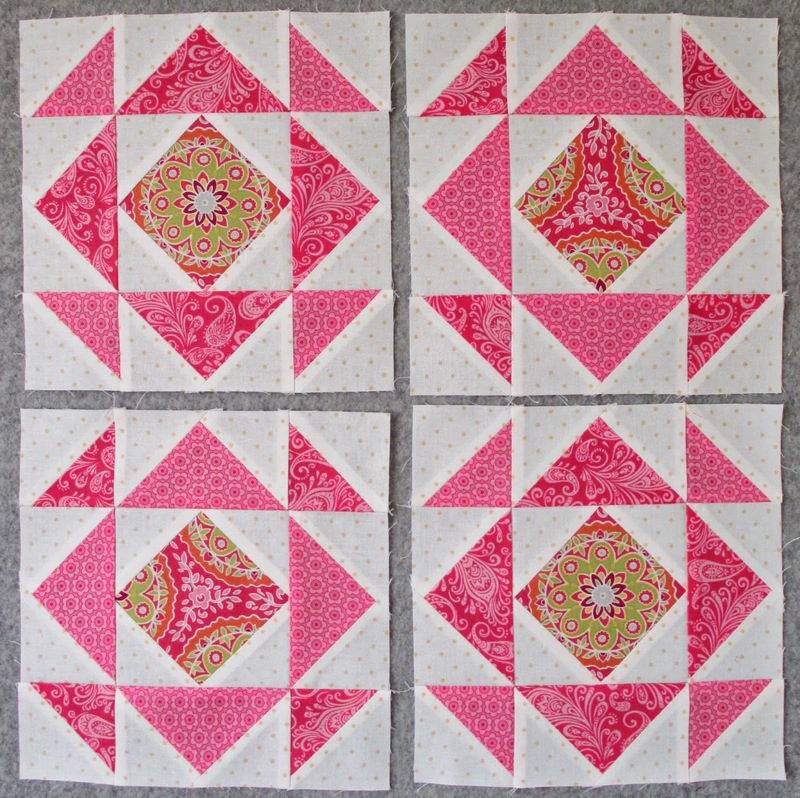 Someone else who shares my taste in quilt projects is Sinta at Pink Pincushion. We've never sewed projects together but Sinta rarely finishes a quilt that doesn't go on my To Do list and she is currently working on Coastal Lilies and Evening Bloom, two of my favorite finishes. Plus there are the Schnibbles we make every month. For over a year we've been trying to come up with a project to sew together. Well we finally have one and it was this fabric that got the ball rolling, High Street by Lily Ashbury for Moda. 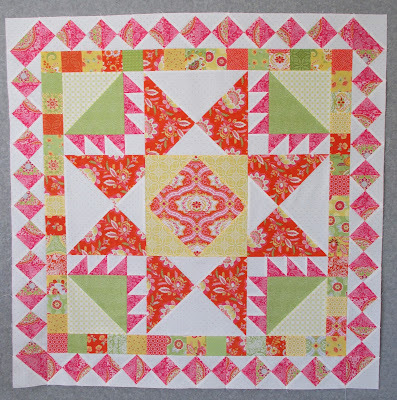 I saw a fat quarter bundle online and fell in love with the design and colors of this family. I also thought it looked like the kind of fabric Sinta usually goes for, shabby chic. So Sinta took one look and said she was in. Then we needed to decide on a pattern. We both love Summer Wind, have not made it, and there you go. 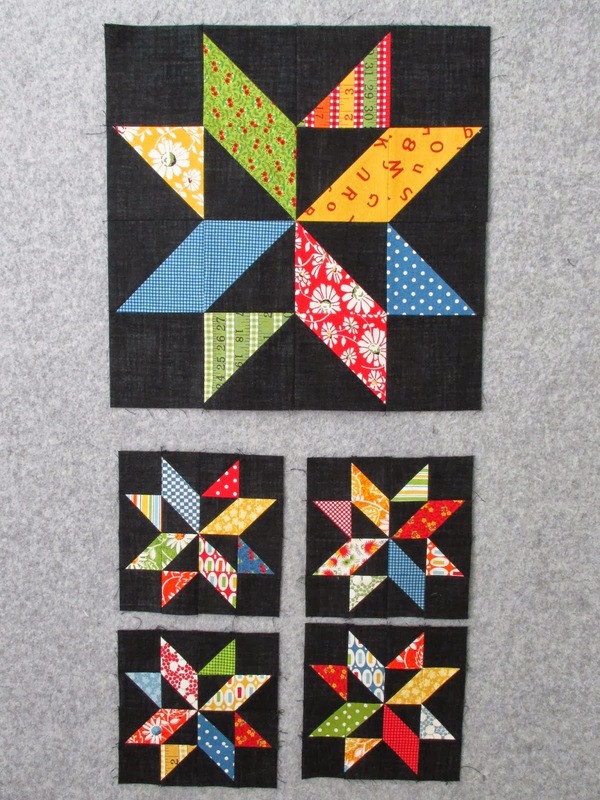 The only problem with using a fat quarter bundle for this project is that the large center star requires two like fat quarters. So Sinta and I decided to pick a fabric for the center and exchange fat quarters so we would have the two matching fat quarters we needed. Here's the fat quarter I selected and the one Sinta mailed to me. 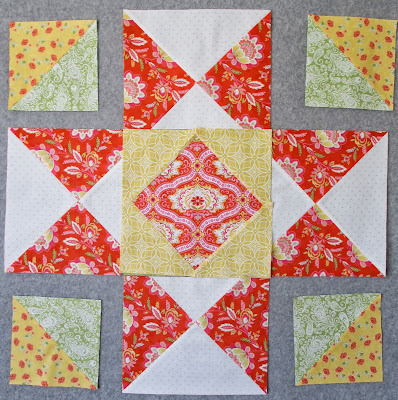 I think it made this sew along a little more fun, having to exchange fat quarters before we could even get started. So once the swap was done we were ready to start. Right off the bat I struggled, I think it was a case of too many pieces of pretty fabric to choose from right from the start. So here's my first center. But I decided I didn't like the yellow so I switched to green. But once I added the corner pieces I decided I didn't like the green. So I went back to the yellow. And changed the corners, but I'm done now and I'm happy, so that's all that matters. The rest of the rows are scrappy so I don't expect to struggle anymore with my fabric choices. I'm using the Summer Wind pattern in the A Touch of Rosie Quilts book. So if you would like to sew along too and have this book, you're set. If you don't have the pattern Carrie will have a PDF pattern available in her store soon. I'll let you know when it's available. Sinta enclosed this note in the package with her fat quarter. I am ready, set and going! Sinta is blogging about her progress on Summer Wind today. We're using the same pattern, the same fabric bundle, and Sinta's center has a very different look. Be sure to check it out.